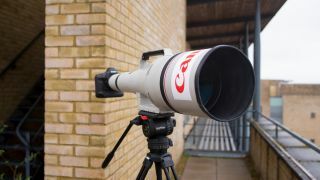 If you fancy getting your hands on Canon's mighty (and we should say, extremely rare) Canon EF 1200mm f/5.6L USM telephoto lens, then head for Park Cameras' Burgess Hill store in West Sussex on Saturday March 4. The lens has a mysterious history, and its hard to say how many of them actually exist. What we do know is that this lens can chart its history back to the 1984 Olympic Games in Los Angeles, where five FD mount lenses were used by the press. After being returned to Japan they were converted to Canon's EF mount, with the lens made available to purchase via special order. A $10,000 deposit was required, with the lens only going into production once several optics had been ordered. There are now thought to be only around 20 in existence, with one used model appearing three years ago with an asking price of £99,000. As well as the epic EF 1200mm f/5.6L USM, Park Cameras will also have every Canon EF lens currently in production available to get your hands on. Technical experts from Canon UK will be on hand to answer your questions, while Canon geek and professional photographer David Newton will be holding a series of free seminars. To learn more and to book a space on a seminar, visit the Park Cameras website.